Price is 19% below the initial Lego retail price, a € 25.90 discount! This comes down to 9.17 cent per brick. The Capital City (60200) Lego set is available from the sites below. However, they do not offer delivery to your selected region. 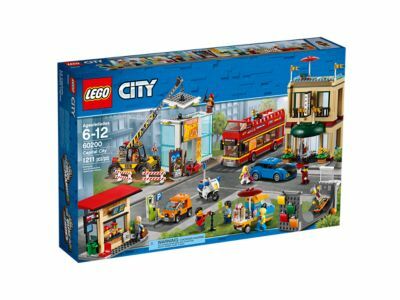 The Capital City (60200) Lego set is no longer directly available from the sites below. However, 3rd party partners of these sites might still have the set available. Alternate description See the sights in downtown Capital City! Includes 13 LEGO® minifigures: a hotel bellhop, hotel customer, bus driver, ice cream attendant, skateboarder, street musician, city traffic cop, 2 construction workers, tourist, IT businessperson, kiosk attendant and a museum caveman. Features a 2-story hotel with rooftop terrace, umbrella, lounge chair and opening doors, a museum construction site, an electric car charging station with plug, fast-food kiosk with seat, plus a skate ramp half-pipe with climbing wall and basketball hoop. Also includes 6 vehicles: a sports car, double-decker tour bus with opening door and seats on the roof, an ice cream tuk-tuk with umbrella, crane with moving arm and lowering hook, electric car and a police motorbike with bubble light element. Accessory elements include a basketball, 2 hot dogs, microphone stand, guitar, skateboard, camera, newspaper, cup, crate, trash can and a safety barrier. Raise building materials into place by turning the knob on the crane arm. Plug the electric car into the charging station to pretend to recharge for the drive home. Hop on the skateboard and pull daring tricks on the half-pipe. Hotel measures over 9” (23cm) high, 5” (13cm) wide and 4” (12cm) deep. Museum construction site measures over 4” (11cm) high, 4” (12cm) wide and 2” (6cm) deep. Kiosk measures over 3” (10cm) high, 5” (13cm) wide and 2” (6cm) deep. Skate ramp measures over 3” (8cm) high, 5” (13cm) wide and 1” (4cm) deep. Crane measures over 7” (18cm) high, 5” (13cm) long and 2” (7cm) wide. Double-decker bus measures over 3” (10cm) high, 7” (20cm) long and 1” (5cm) wide.